Online coding bootcamp Thinkful has recently expanded into Data Science! We sat down with Head of Education, Grae Drake, and Lead Data Science Instructor, Alex Nussbacher, to learn more about their new online Flexible Data Science Bootcamp. If you’re interested in data science but feel you don’t have enough flexibility to learn full-time and in-person, then keep reading. 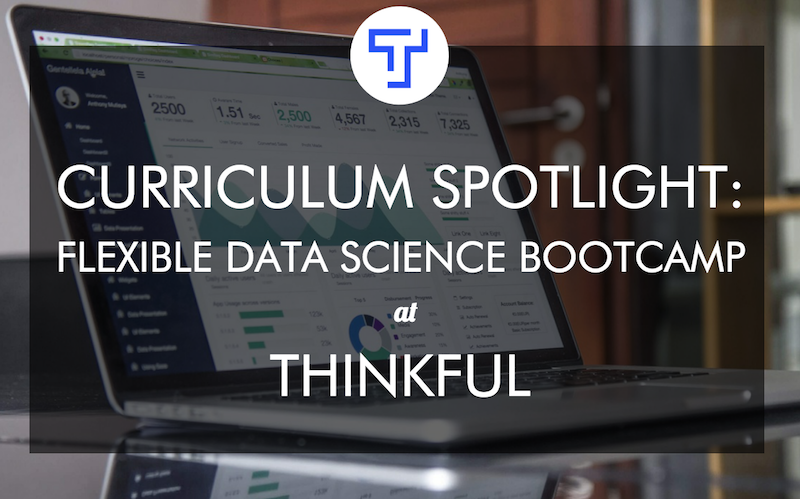 Learn why Thinkful chose to make the application process a three-week prep course and how they created a curriculum full of real data sets, experiments and projects to build a comprehensive portfolio. Why expand Thinkful bootcamps into Data Science? We've been teaching data science for a couple of years as a Skills course. We've learned a lot over the last year from our Web Development Bootcamp, and we’re now able to invest that learning into data science. We could’ve chosen to teach mobile development or product development, but we chose data science because it's where we see the most opportunity in the future. Your job title may not be “data scientist,” but the ability to think critically and use large amounts of data to make informed decisions about new business is a skill that will be relevant to many different positions. The demand for qualified applicants who have those skills will continue to grow aggressively. Can you really teach data science through an online, flexible bootcamp? Bootcamps are very oriented towards practical outcomes. In academia, you care a lot about theory and publishing research. In industry, you care about adding value to a team and making a product that people want to use. Data science is oriented towards industry – how do we make our product better? How do we make intelligent decisions about what to do next? How do we enable behavior that wasn't previously possible? This job is very much based on practical skills, which are well suited for learning in this type of format. What are the admissions requirement for the Flexible Data Science Bootcamp ? Are you looking for applicants who have some technical background? This is the first Thinkful program that has an application process. In general, we've been as open and as accommodating as possible to students. We don't want to raise barriers to students. Web development, in particular, is a field that is accessible to anybody with interest. I think that data science is a little bit more demanding and in order to be successful in our data science bootcamp, the bar is higher. Students are learning a lot of math, programming concepts, and computer science fundamentals at the same time. You're learning to use very specialized data science tools that are themselves quite sophisticated. Specifically, we're looking for somebody who has a combination of experience with programming, math, statistics and scientific research. In addition to that, we’re interested in somebody who has demonstrated the ability to work very hard in a relatively independent setting through our three-week prep course. We designed the prep course as a way to give applicants a perfect sense of what the bootcamp is going to be like and for us to see them working in that setting – working with a mentor, demonstrating the persistence and grit that you need for a self-paced program like this. Do you give applicants a Python coding challenge? We don't. Instead, we ask students to write Python and talk about Python with their mentor in the three-week prep course. They are spending nine hours with an expert talking about Python, and we ask those students to put together a capstone report at the end of the prep course. They're using the Python, statistics, and fundamental data science packages that they learned in the prep course to put together that capstone report. They have to find a data source that they’re interested in exploring, use the tools they’ve learned to ask and answer three analytic questions of the data, and then propose a deeper research question that they’re not currently equipped to answer but hope to be once they’ve got the tool set under their belt. That's actually a really cool admission process! Why not just filter out students without a specific technical background? We think the best way to see how capable somebody is at doing data science is to see how they do the actual work. Other bootcamps filter based on a student’s background, very rigorously. If you haven't been in academia and you haven't been a programmer, and you've been self-learning the entire time, it can be difficult to show your potential to a full-time, in-person data science bootcamp. Our prep course is open to everybody. So if you come in and show that you can be successful, then that's what we want to see for admissions. What is the difference between Thinkful’s Data Science Skills Course and this Flexible Data Science Bootcamp? The Thinkful Data Science Skills course is one of our lower intensity courses. It's designed for people who are looking to pick up a related additional skill on top of their current skillset. It's perfect for somebody who has a handful of hours a week and wants to learn something new over a longer period of time. It does not go into the details and depth that we do in the Flexible Data Science Bootcamp and does not get you job-ready. The Flexible Data Science Bootcamp gets you job-ready and includes much more one-on-one support and other types of support. You'll be meeting with your mentor frequently, you’ll have dedicated career coaching, job search support, and networking support. Should someone take Thinkful’s Programing for Python course before the Flexible Data Science Bootcamp? The prep course for the Flexible Data Science Bootcamp is perfect if you want to pick up Python for data science. The Programming for Python course is better if you want to pick up Python for its own sake or for web development. 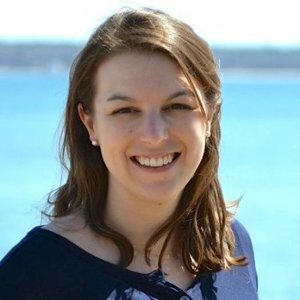 How did you develop a full curriculum for the Flexible Data Science Bootcamp to get students ready for their first job as a data scientist? We wanted to give people a really broad and solid base. One of the things we learned while teaching web development is that deliverables are crucially important, because they give you a clear goal and keep you accountable. Also, you’re applying the learning in a real-world context and then you’re able to show that work to employers. That is something that we are keeping very prominent in the Flexible Data Science Bootcamp. We also want to teach these various tools through industry-focused examples and experience-based examples. We'll use mentors to reinforce this learning, but we want students doing real data science work. I'm also particularly happy with the emphasis that we're putting on experimentation, which falls on the fringes of data science. We want to make sure people can go out into the wild, into a company. Why did you decide to teach Python vs R? We're starting with Python because we love the range of applicability that Python offers. It’s appealing to us and to students. The Python versus R topic is an interesting one. Chances are good that you might end up using both Python and R in practice. In a program like this, we need to focus on one language, but if you want to learn R in parallel to Python, then we can help you do that. That’s one of the things I love about a flexible program like this. Tell us more about the projects that students will build during the bootcamp. We're starting off very structured, and then give students more freedom as we go forward. We'll give students data sets– for example, the Bay Area Bike Share– with very specific requests and requirements. That gives students a preview of how much you can actually learn from real-world data sets. We're asking them to find the answers to questions like, “how many people rode their bikes on rainy days?” We’re also using AirBnB data, which is a pretty big, open data set and a product that our students are familiar with. Over time, as you become more competent, we give you a bit more freedom in the data science workflow. We've always been very flexible and accommodating for people who want to do something different. Data science is a very big road. We're going to teach you the stuff that you're going to need to know for any position, but we also want to give you a chance to go deep in a particular area, like finance, economics, natural language processing, biostatistics, image recognition, or visualization engineering. We have a very explicit section of the course that is focused on the particular industry, specialty, or technology that most interests you. This specialization paired with a broad base produces the T-shaped data scientists companies are looking for. Because this is the flexible bootcamp, what does that mean for student-mentor interaction? How much time should a student expect to be spending with their mentor? Students work with their mentor one-on-one for three hours per week, and there are a number of other times that you can join mentors for the data science course or Python mentors for their open sessions. We specifically designed the bootcamp to work with people’s full-time jobs and commitments, but it is still demanding. Is anyone currently enrolled? What types of students are excelling in the Flexible Data Science Bootcamp? The entire time I've been at Thinkful I've always been shocked at the variety of students. Our current students, who are just finishing the prep course, don’t have similar backgrounds. One student is a career academic who taught computer science at college and wants to actually get into the industry now. One student is a serial entrepreneur who's owned a number of businesses and is looking to pivot out of that. We have a student who’s been writing high-performance C++ code for 11 years and is a very talented engineer, but wants to switch to the data-driven side of programming. Another student is a philosophy undergrad who has no technical experience right now. He is finding the prep course very, very demanding because he doesn't have that technical background. Do you offer a job guarantee for the Flexible Data Science Bootcamp? We're not offering a job guarantee with this course. Frankly, we also haven't seen the job guarantee be super relevant to our web development bootcamp, and so far only a single graduate has needed to use it. There is job placement and career assistance included in the Flexible Data Science Bootcamp, right? Correct! You essentially have the same job search support as our Web Development Bootcamp. During the bootcamp, we put a lot of effort into networking efforts, making connections for you, helping you make your own connections. We also conduct mock interviews so that you are ready and comfortable talking about data science with data scientists once you get into the interview setting. For the Flexible Data Science Bootcamp, we'll be adding presentations, which is a little bit new. Communication is a much larger part of data science than web development. Once you graduate, you’ll get one-on-one support from a professional career coach. They'll help you with your resume, LinkedIn profile, GitHub profile, AngelList profile, and your portfolio. They'll help you understand the interview process, and help you understand how to craft a resume so that it makes it through the applicant tracking system of the enormous company that you'll apply to and is actually seen by a human. As a company, the Thinkful team members are all nerds about learning, and I've been really happy to see how many of my colleagues want to take this course! Read a Thinkful review on Course Report and be sure to check out the Thinkful website!